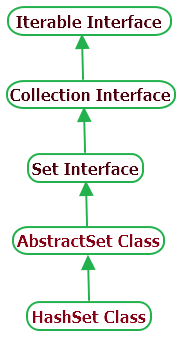 HashSet is a class of collection framework which extends AbstractSet class and implements the Set interface. HasSet doesn't guarantee that elements order will remain same over the time and returned in any random order. HasSet doesn't allow duplicate values. If you try to insert duplicate, It will overwrite. HasSet allows to store null values. HasSet implementation is not synchronized. boolean add(E e) : To add elements in to set if it is not already present. void clear() : Remove all entries from set. Object clone() : It will returns shallow copy of HasSet instance. boolean contains(Object o) : It will return true if given values is present in HashSet. boolean isEmpty() : It will return true if HasSet is empty. Iterator<E> iterator() : It will returns an iterator over the elements in Set. boolean remove(Object o) : It will remove specified elements from set if it is available in HashSet. int size() : It will return size of HashSet. Bellow given example will show you usage of different HashSet methods. //Check if HashSet is empty. hset.add(null); //HassSet allows null values. This way, You can use HashSet to store values in random order including null.